Today’s message is going to be a little bit politically controversial and I want you to know my intentions aren’t to even to try to broach it, this subject that way. I don’t really care so much about how it enters in the political arenas or not, I really wanna be just biblical, honest and truthful. Knowing that today though is a sensitive subject, I also wanna be loving and gracious as to how we interact with this topic because the topic of today in dealing with the sanctity of life starts really at the root of the world view. In our culture today we have various pressing world views that depending on where you begin in this, addresses how you end up in your answers to some of the results of the sanctity of life. I finally got a biblical overview. Some of those things become very contradictory, I’ll identify some of those for us. In this topic he’s representing his atheistic world view and he’s particularly addressing the idea of suffering. But in his concluding of this thought, he really comes down to the idea that in regards to life, it’s really just pitiless indifference and really there’s no purpose to it at all. There I don’t hold this view that Richard Dawkins carries that seeing no divine design in anything, I appreciate the honesty he shows with his world view. Because I find that it’s accurate. In fact if I held his world view, I would hold to this statement. The reason is, if you hold no ultimate purpose to life, no ultimate design or creating life, you really have two choices. Either answer impossible questions related to ultimate purpose of life, like why are we worth anything, where did we come from, where are we going, what is the meaning of life. You can’t give any alternate definition to that because there’s no ultimate reason for which things come into existence. Or you can take Richard Dawkins world view, which all human life is pitiless indifference or all of life is pitiless indifference, it’s meaningless. Now why I say I would most likely hold to his world view, I would also acknowledge that I couldn’t live that way. I would go out and demand that my life carry worth and value. In fact, everything that I did would suggest it. The morality I hold, the values I carry, the pursuits in which I live my life. If you hold the world view that there’s no purpose to life and you really, I don’t find can live consistently with it because life just randomly happens and you can’t life today as if today would be consistent with tomorrow. I mean it’s just random, right? So you come with questions like, if we have no ultimate purpose from here, where do we get our value? As human beings are we more valuable than anything else? What about if I were to hold this up this morning, just the idea of a rock. What about a rock, this rock just happened to exist the way that I existed, we just sort of evolved in different ways. Do I have more value than a rock? Why do I even consider the question of value important if we came from nothing to begin with. Where does the idea of even needing a value system derived from? If I were to punch this rock, would you care? Not really, you might think I’m crazy. But what if were to walk off the stage and punched the person next to you, would you care? That’s a different story right. I mean without even having to argue the need for intrinsic value within human beings, you don’t care, you might think I’m nuts, but you don’t care about me punching a rock. But if I were to come down and punch a person, we’re gonna have some words, right. Please stop me if I ever do something like that. But the reason is because we recognize that there is dignity, worth and value in a human being, and when I go to destroy that image, there’s something that rises up within us that just desires for that to end. So while we may look at a view that life being described as pitiless indifference, you have to hold that view without a divine design because everything comes just randomly into existence. There is no moral ott that you can hold all of humanity to because there’s no moral ott giver for which life should matter and to give us meaning worth value on how we should live. We won’t live that way. I think that thought or this idea of pitiless indifference is, and the need to hold that world view without a creator is the reason that Norm Geisler, Frank Touareg, they got together and wrote a book called, I Don’t Have Enough Faith to be an Atheist. Because they realized that in life, without even being told, we recognize right from wrong and where does that come from? We hold value in the identity of who we are and where does that come from. So rather than describe life as pitiless indifference, I believe that life is precious, we should understand our worth and purpose. Every culture has to address the basics of life, the purpose, meaning and value of life. Every culture has to struggle with it, within that culture, every individual has to confront those ideas. To wrestle with the thought of who you are. I believe that’s the very reason that God wrote the book of Genesis. God wanted the Jews to understand Him and their identity, their worth and their purpose and their value. If you understand what led to the writing of the book of Genesis, Genesis written by Moses. Moses leads the children of Israel out of Egypt in which they had been slaves. Living a life of slavery you can imagine the kind of questions that you might ask in regards to your worth. Who am I, where do we come from, where are we going? Why am I worth anything? I’ve been treated like dirt. Being a Pastor for several years now, I’ve been a Pastor long enough to know people tend to not think often the best of themselves, like it’s rare. You do run into those people every once in a while that thing they’re just God’s gift to creation, but most people don’t think that way. I think it’s even more true, I know in life you get to that awkward teenage stage where you don’t know what to do with yourself and you get to your twenties and you’re invincible. But the older you live your life, the more you begin to realize man you’re really not that impressive. You start to learn all the things you really don’t know and so we tend to not think that highly of ourselves, but Genesis chapter one is really that chapter where we see the goodness and grace of God. God creating for a purpose and a reason, defining the identity of these Hebrew slaves coming out of Egypt to see themselves and the worth and value and meaning and purpose which God had designed them. So they could live life to the fullest. So when you turn to Genesis chapter one, most of you are probably familiar with this passage. It’s in the beginning God, it assumes the existence of God, but it says in the beginning God and He creates right? God creates everything. He speaks and life begins and what it’s showing us is this creator designing things for intentional purpose, not randomly existing. But God has an idea in mind the pursuit for the things for which He has created. Then in verse 26, it gets to your identity, He says this, and the Godhead, He says, “Let us make mankind in our image and our likeness so that they may rule.” So God created mankind in His own image, in the image of God, He created them male and female He created them. So God saw all that He had made and it was very good and there was evening and there was morning the sixth day. If you read the section of this passage, what it’s saying to us is one, everything God creates is important right? Everything God makes is important. All of life is important. As this is describing and demonstrating the beauty of life, the last thing God creates, the crown of His creation is mankind. When God creates mankind, He creates him to reflect creator God in creation by caring for the things for which God has created. But God designs us in His image and the beauty of who we are reflecting His goodness in this world. The crown of His creation, on the sixth day we know what happens after this, God rests. The very last thing that God makes, it tells us at the end of this that God says it was very good at the end of this chapter and God rests. As if to help us understand exactly what this creation means, when God makes us in His image, it doesn’t mean He makes us in His image in every way. But He does make us in a way that’s unique from any other thing He created. While animals are wonderful things, there’s something special that God does uniquely in humanity different than all other creatures. What is it, it’s His image. Chapter two of verse seven starts to share with us exactly how that looks. It says, “then the Lord God formed a man from the dust of the ground.” What it’s saying about us is like being made in God’s image doesn’t mean that God has a physical body and therefore God gives you a physical body. But rather, you came from the dirt. So God created you from the dirt, but here’s how special it is. When God made everything in Genesis, He speaks life begins. But when God creates mankind, He doesn’t just speak, He forms. This shows intimacy with Creator God. He takes time to shape and to mold for a particular purpose and then it goes on from the ground, “and then He breathed into his nostrils the breath of life and man became a living being.” This idea of breathing into the nostrils of mankind, in the Hebrew the imagery is literally face to face. That God is so close to you, nose to nose, mouth to mouth and breathes life into you. This means you now are created to connect to your Creator. The worth and value of who you are, could you imagine being a slave and all the things that have been told to you about life and your lot in life. If they believed in the God in all, the belief that would have been stretched then is look, yeah there’s a God and yeah you were created, but God doesn’t like you, that’s why He made you a slave. But now in this story what we find through both male and female is that every person created with intentional design by Creator God for the purpose of being intimate with Him and to know Him and to enjoy Him for all of eternity, everyone equal, value, worth, meaning, purpose found in God, not beneath Him, not beneath each other I should say, rather equal to one another. Every culture and generation will address the significance and purpose of human life and struggle to uphold it. Every culture has it, every individual. We started with the world view that expressed one way and it will lead down a particular path and how you live that out. Here you see in the Bible as it relates to the identity of who we are. Even today, our culture will wrestle with what makes life important. In fact one of the passages I think is significant as it relates to holding this view and scripture is Romans, chapter 12. If I were to back up in that chapter and just read the last verse of chapter 11, I think this is very important because this is the springboard verse into why verse 12 is so significant. By the way these verses that I’m reading to you this morning, these are popular verses and when you study scripture that most people are familiar with. But I think important for us, a reminder to our identity. But Romans 11:6 says this, “For from Him and through Him,” talking about God, “and to Him are all things.” Meaning when you think about the worth of anything in this world, all of it has purpose and value and meaning because it’s derivative is in the identity of who God is. God, when He created, He not only gave life, what this verse is saying is that He is life. That’s why anything in this world, and I can even hope to sustain because the identity of who God is. So the author says in this verse then, is Paul to Him be the glory forever, Amen. So it’s showing the identity of our world view where we get everything that we understand in this life is found in God. This becomes the springboard for us and then the understanding that, then he says in Romans, chapter 12, “therefore I urge you brothers by the mercies of God to present your bodies a living and holy sacrifice acceptable to God, which is your spiritual service of worship. Then he shows what’s gonna conflict with this, “Be not conformed to this world, but be transformed by the renewing of your mind so that you may prove what the will of God is, which is good, acceptable and perfect.” Can I tell you, when God created you, God didn’t create you because He needed anything. This is what this verse is saying to us and in verse 36 is that God is sufficient within Himself. God didn’t create you because He was sitting in Heaven thinking, you know I just have this emptiness inside. I need to be loved, so I just wanna throw these people out and they’re just gonna tell me how amazing I am. That would be an inadequate God, God does design that way. But rather, God is good and God is love, and God is creative. In the goodness of His creativity and the love that He desires to express, He gives himself away. So God designed a creation for which He would give himself away. He allowed that creation and it’s freedom to reciprocate back to Him being made in His image. He didn’t design out of inadequacy, He designed out of love and the desire for you to experience that love into love in return. So He’s saying in this passage, this all comes from, this is where our world view is shaped, and understand this, verse two, “That there will be contrary world views to the identity that God desires to put on you,” or the identity that God has already placed on you. As you walk life, don’t be conformed to this world because what this world will do is try to conform you into an image that contradicts the world view of God. Our bend as human beings is to run in the opposite direction God and diminish the image of humanity. I saw it last night at home over a banana. I’ve got a five and eight year old and you thought World War II broke out again over a banana. It’s like you would’ve thought we told our kids, look mom and dad we’re discussing it and we decided five and eight years old, you guys are good. Pack your bags, you need to go. I mean the screaming and battle that ensued in our house over a banana. The depravity of humanity was made known, and I know I’m not alone, don’t make me feel like that. I know you’ve got kids, you know what I’m talking about. But the bend of humanity and even the way we interact with other, it’s to diminish the value of who we are. You know the Bible consistently emphasizes for us, when we honor life, truthfully it’s worship before God. How you treat people in this world, in your mind, should be considered an act of worship before God. Because everyone created is an image bearer of God made in His image, [inaudible 00:18:10]. Every created being is made in the image of God, so how you treat that soul is worship before the Lord. That should start in your marriage, the way you interact with your children, and the stranger on the street that you have nothing to gain from, and get this, even your enemies. So you ask the question, “where does a human being receive it’s worth apart from God. If there is no God, apart from God how do you determine the worth of a human being. If it’s not intrinsically based on who they are, then what are you left with? It’s saying just because people are hurtful does not ever give you the right to hateful because their image bearers have got to. Jesus even said in Matthew 5:44, pray for your enemy. Why, because they’re worth isn’t based on what they do, their worth is based on who they are and God cares about every soul and how you treat a soul is worship before God. Every life matters. Not only does every individual, every culture, every generation has to wrestle with the significance of life. I think the church is called by God to help every culture and generation wrestle with the significance of God and human life because it has tremendous impact on the implications of where that society goes. The sanctity of life is sacred, and this is so gospel centric to the identitY Of the church that we don’t need to be handing it over to anyone else in this world. When you think about the significance of life, if anyone can identify it, it is God’s people. So we don’t give it over, rather we wrestle, in our society, for it. The Bible is loaded with verses that speak directly and indirectly to the significance of life. Genesis One starts with that story of who we are in light of who God is. Then it tells to the Hebrew people how their story was shaped starting with goes into creation, but it dives quickly into Abraham in the end of 11 and into 12. Then on into Moses they and see how God’s hands work in the brokenness of life. One of my favorite passages when it talks about the significance of life is Jeremiah chapter one and verse five, it says before I formed you in the womb I knew you. Before you were born I consecrated you, I have appointed you a prophet to the nations. Now let me tell you something theologically important about this verse before I dive into the sanctity of life part. This verse tells us that God knew Jeremiah, this verse does not tell us that Jeremiah knew God, and that’s a big difference. But what this verse is saying is that God knew Jeremiah, meaning when life comes into existence, we might be shocked by it, but God’s not. God already knew because God is sovereign, God is all knowing, He’s knows the number of your days. He knows right where you’re at, there’s nothing that you can hide from Him, God knows. God’s not surprised by your beginning. The reason this is so important I think especially in the beginning of the book of Jeremiah is, if you know Jeremiah at all the prophet, he was referred to as the weeping prophet. I think about my own life in this, or at least my mother. My mom walked a difficult road just to have me. My mom gave birth to me when she was 16 years old, which is not an easy path. Went on to get her bachelor’s degree, master’s degree work as nurse, not easy. Was God shocked, she might be shocked when I show up right? But was God shocked, no. Things in life may get difficult things in life may be messy, but regardless of how difficult the circumstance, God’s not surprised. It may be all mess, but it’s in His hand. That’s what Jeremiah 1:5 is saying Jeremiah may look at the around you it may be difficult, there may be a hard road to walk, it may be but look, I am so in this and I am so with you, even before you existed I knew the number of your days, I knew what you were gonna walk through, I knew and I called you. The same thing is true for all of us. In fact, probably the Psalm that would speak to this the most for us is Psalm 139. I remember when I first became a Christian, I found this Psalm. I remember just reading it over and over, couldn’t believe just the words expressed in this chapter as it relates to the significance of life. So some of these verses just listen to this, “you formed me in my inward parts, you wove me in my mother’s womb, I will give thanks to You for I am fearfully and wonderfully made,” and [inaudible 00:25:11] image on me. Wonderful are Your works and my soul knows it very well. Our soul knows that when you punch a rock no one cares. But if you punch a human being, there’s worth there, you’re diminishing the value. How precious also are your thoughts to me oh God. How vast is the sum then, if I should count them, they would outnumber the sand. Life has value, yet despite these reminders, culture always battles. Culture always restless, culture has a bin in the confirming to the things of this world to take away and rip from that image. In fact in Israel’s history, God told them not to embrace the false worship of the king like gods, report Baa’l and Moloch, and Israel did. In the same book of Jeremiah, it says this in chapter 19 and of Judah specifically, they have built the higher places of Baa’l to burn their sons in the fire as burnt offerings to Baa’l. What are they doing? Diminishing the image of God and the life of a human being. In Israel’s day, individuals would have these false gods, they would build these statutes or shrines dedicated to them, and this particular one they would heat it up and the arms would become burning hot and they would place an infant in the arms. You actually go back and read some of the historical statements of different individuals that encountered this worship, not just with Israel, but in history. I thought about offering a quote for you this morning, but they’re so wicked and hard to read, I would just tell you they exist and you can find them if you want. The diminishing of human life and how did they get there. Well it starts in buying with the lie and identity of who human beings are. But in Israel’s day they believed that these gods would be appeased and provide for them the resources they needed to live. So you think in Israel’s day you didn’t have a refrigerator. If you wanted to survive, you were dependent on that day to supply for you the need or what you needed. So when there was drought or there was ever any adversity or they’re hoping for a good harvest, they wanted to make the gods happy, they believed that this god was one of the gods they wanted to appease and this god needed sacrifice of life, innocent blood in order to provide those things for people. So they would offer it and some of the stories are horrible where you have wealthy individuals that didn’t really wanna sacrifice their kids, they would go to more poor families and they would offer to those families money in order to buy their kids so they could just sacrifice those children rather than their own, and there’s accounts of all kinds of gross things. Even the historical archaeologist digging up graves where thousands of children have been sacrificed. Many of them placed in these urns, on the outside of these urns after their bodies would burn or dedicated statements to the false gods which they worshiped to offer that life. You can look one of those places up, I think it had 20,000 children in the town of Carthage, and that wasn’t the only funeral or the only cemetery they found with remains of kids that had been burned. This is one town. The diminishing of life. When you think about Israel, you can look at that and think how wicked, how horrible, how difficult. You think in their world view they don’t want God to be mad so they can have their needs met in order to find the pleasures of life they give over human life. To be honest, I don’t think we’re that different. I think maybe in our society today we may have sanitized some of the things that we do, but we struggle to properly value life too. One of the ways that we know that or identify that as January we’ve encouraged as the Sanctity of Life month, January 20th is the Sanctity of Life Day where we just focus on promoting the value of life because lives matter. Sanctity of life demonstrates or tells us one life matters and to acknowledge it, I’ll also say that God has made life sacred, all life. I think when it comes to the church, the struggle that we work in society through is everyone that’s marginalized and under appreciated in their life. If it’s women, if it’s children, if it’s orphans, if it’s widows, if it’s refugees, if it’s the sick, if it’s the poor, anyone down and out, anyone with any sort of special need that’s underappreciated in life and the value of who they are is diminished, but the identity of God needs to be told over and over, even you. God made you sacred and important. Out of all those topics that we should address, one that I don’t wanna move past too quickly this morning is even the idea of the value of a life in the womb and the topic of abortion. Out of all the people we could represent and talk about this morning in the sanctity of life, all of those were important, all of them are important. The reason I think the highlighting of abortion is most important is because they’re the most vulnerable, they’re the voiceless. It’s the one in which you can give a voice to for us. The reason I think that, and when I talk about Israel not being that much different than our society today is that when you study the topic of abortion, this is a very emotional topic, a very difficult topic, but statistically when you look at the statistics of those that partake of abortion today, it tells us that one in five pregnancies or over one in five pregnancies in our country go that direction. That one third of women will have experienced one. Over 90% of the reason behind why abortions are done are because of social needs. Meaning they don’t really feel like they’re at a place where they’re ready for a child. Whether it be because they don’t think that they have enough money or the child, there’s relationship problems between the father and mother or someone’s too young. Whatever it is, there’s social reasons over 90% of the abortions that take place is for that reason. 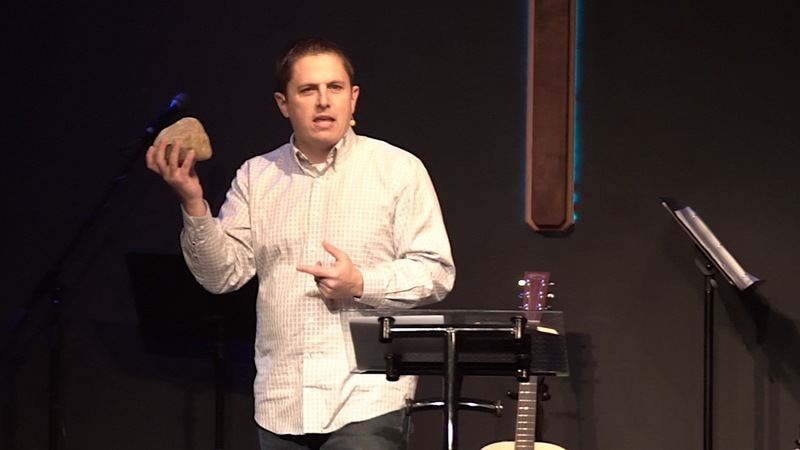 We look at Israel in the Old Testament making sacrifices. It was done for convenience, I want more food, I want to live an okay life, therefore I wanna make gods happy. The only difference between the two is that our gods have changed. The argument for abortion, it’s interesting if you study the defense between pro-life and pro-choice. The argument used to be in Roe v Wade that whether or not it’s a life, is it a human life inside of the womb. Technology has really made that outdated, today no one would argue that by the eight weeks in the life of a child in womb, you can detect heartbeat, all the organs working, brain waves, the baby recoils from pain. At eight weeks a baby even starts sucking its thumb. So I question as to whether or not it’s life, that’s not even the argument that’s made anymore. The argument that’s made now is over women’s rights and the worth of a dependent life. If a life is dependent, should it be given the freedom to live or do we get to choose. When it comes to women’s rights ladies, I want you to know that I love the fight for women’s rights. Like women please, dignity worth value, created in the image of God, that is important. I think what we have to keep in mind is that when you talk about the idea of abortion, who’s gonna fight for the right of the women in the womb? For when it comes to the idea of whether or not life, if it’s dependent is worth having or if it’s worth less. What about people that have dependencies on medications or different types of medical needs in life where they’re relying on things, it doesn’t make their value any less. It’s kind of interesting in our society today the things that we hold to as important and the things that we don’t. I feel like sometimes we get our priorities just a little bit backwards. Last summer my family and I took a trip to North Carolina on the beach, and I didn’t know this about this area, but apparently lots of sea turtles love this beach. We happened to go when sea turtles decided that they wanted to make sea turtle babies. But they hadn’t hatched yet. When you went to the sand dunes, they created these massive sand dunes for the sea turtles in order to have their eggs, but if you were to walk over to those sand dunes, anywhere near the sand dunes, like a cop would tackle you to the ground and throw you in jail. You’d be like why are you messing with me being near sand dunes, it was like, there’s an egg and you’ve gotta protect it. Like we care more about … you know what would’ve happened to me if I just went running down those sand dunes? I probably would have made national news, killing the sea turtles. I love sea turtles, I watched Nemo, they’re cool right. See I have no problem with sea turtles. Why do we care so much about that egg and so little about others? Maybe if I told you tomorrow you would be in the womb, what would you think about that. Had a doctor say to me once, having a mother that had me at 16 years old, you’re lucky to be alive son. I’m like, you are, I never even thought about that. But he’s right, how easy it would have been. How difficult of a decision it is to make. That was not easy, that’s a hard road to walk. But before I was born, God knew me, in my mother’s womb, He knitted me together, fearfully and wonderfully made. His thoughts towards me of the sand on a shore. I remember when Pioneer Crossing was being built. I read this article, you can go back and look at it. I read it again last night. May the second, third and fourth of 2009, they stopped construction on Pioneer Crossing, couldn’t build the road because there was a hawk and the hawk may have had eggs in the tree. They didn’t even know, if you read that article on May second, they’re like we’re not sure there could be eggs up there. But just in case, we stopped everything and then by May fourth, they’re like, they write another article and we hired a conservationist and now he watches the tree. If the bird gets upset, we stop construction. Pioneer Crossing took longer to build because we had to watch a hawk, and God forbid the eggs. Life, it is all important. Let me run with this and get to the conclusion here. I love this picture, this was taken by Michael Clancy of a young baby names Samuel Armas. In 1999 there was a procedure done on this baby at 21 weeks. It was a revolutionary procedure so they brought a photographer into the room to document it. The baby at 21 weeks, they performed the surgery and as they’re getting ready to close the wound, put the baby back in, the baby reaches out and grabs the hand of the doctor. Michael Clancy went in that room pro-choice, but when he saw the hand of the baby reaching for the hand of the doctor, he said that day he walked out appreciating the beauty and value of life, he was for life. You guys all this to let me give you a conclusion. If you’re here today and what I shared this morning doesn’t represent your world view, can I just say even if there’s a small possibility of what I shared today being correct, it should encourage you to hesitate on acting out any pro-choice. If God did design life, and God cares about life, the reservation of that even being a possibility should be held within all of us regardless. If you’ve gone through the experience of abortion, I want you to know as a church, one third of women, we’re not angry. God cares about your life, nobody hates you. In fact I would say as a church we love you. John 3:17, Jesus says this, “I came not to condemn the world, but save the world.” We love you, we care about you. The reason we care about you is because your life is important. When something like that happens to us, we carry guilt and shame and regret. But because life is important, I can tell you this morning what you need is grace, love and forgiveness, new hope, that’s Jesus. He came not to condemn, but to give life. I love the story of the woman caught in adultery. Her sin exposed, they bring her before Jesus, they have stones in their hand ready to kill her and Jesus says, “let he who has not sinned cast the first stone.” All the people one by one start to walk away, tells us oldest to youngest start to walk away. I can tell you why oldest to youngest, because the longer you live, the more you realize you screw up, right. They all walk away and Jesus says, “Where are your accusers? Then neither do I accuse you, go and sin no more.” We all need the grace of God because your life is important. In church can I tell you for years we’ve gotten this wrong. Some of the most hateful venomous statements come from God’s people. But can I tell you this, at Alpine Bible Church, I don’t care what other people do, but let’s say this at Alpine Bible Church. If you say you love God and you hate someone else, I do not believe it. If you say you love God and hate someone else, you can tell me all day long you love God, but if you hate someone else, I do not believe it, you do not love God. Because the scripture is very plain in telling us this. In I John 4:20, if someone says they love God and hates his brother, he is a liar. For the one who does not love his brother who he has seen, cannot love God who he has not seen. Why, because we understand one of the primary principles of life is that you’re created in the image of God, and the way you treat people is worship for your Creator. Guys we’re called to love. So let me give you a response on how to do this this morning. You don’t change the world by finding a perfect place. You’re called to change the world by walking in a broken place. God called you to be light. So this morning if you just feel led to do something about life and honoring life, in the back as you leave today, on the back table and by the door as you leave, there is some baby bottles there. If you would like, we’d invite you to take a baby bottle and the goal is with your family or even by yourself to just express the value of life. To show before your family the importance of life by giving change into this bottle in order to change the world. We’re gonna collect those bottles in two weeks, January 29th, you can bring them back to the church and we’re gonna donate them to organizations that are about preserving life and communicating the significance of life. The decision my mom made wasn’t easy. But if we’re gonna be a church that says life is important, we also need to be there to support people that choose life. As a church family, in order to give towards that, we’re giving you an opportunity to donate. When we talk about making a difference in life, can I tell you it doesn’t happen without sacrifice guys. Every life is important, starting with yours as we live it out for Him. Let me close with a word of prayer.